After the recent release of “Alice: Madness Returns,” I picked up a copy. 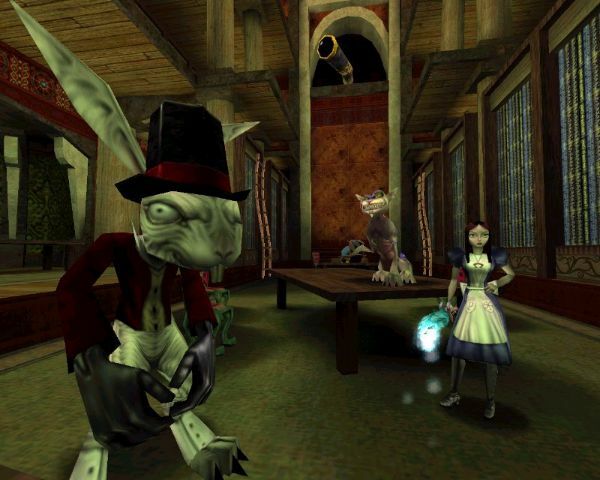 With each copy, console gamers also got a free download of the original “American McGee’s Alice.” Before playing the new Alice, I had to go back and beat the original again. While many things were just as I had remembered, I’m glad I played through it again. The story, characters, and graphics for the most part have aged well for a ten year old game, and as for the rest, I’m hoping that the kinks in gameplay will be worked out in the sequel. “Alice” starts off with quite a dramatic cutscene explaining the basic plot to the story. It is definitely not Lewis Carroll’s canon material. Yet it does give the player a chance to explore a much darker Wonderland. This is not the Disney version of the famous realm; it’s more akin to a nightmare world. You’ll see all the familiar characters, such as the Rabbit, the Cheshire Cat, and the Caterpillar, but darkly modified. The plot is pretty unique, so I won’t spoil anything here. The dialogues, between Alice and the Cat especially, are pretty entertaining, and rely on sarcasm and quick wit, plus the occasional serious plot-related theme. It’s actually quite creative, taking the same overarching theme from the books and turning it around, looking at it in a different light. You’ll traverse areas such as the Caterpillar’s forest and the Red Queen’s castle, and you will also fight your way through a clockwork factory and school. The environments in the game are, for the most part, seriously creepy, and look as if they belong in a survival horror game. The insane asylum and school look very similar. 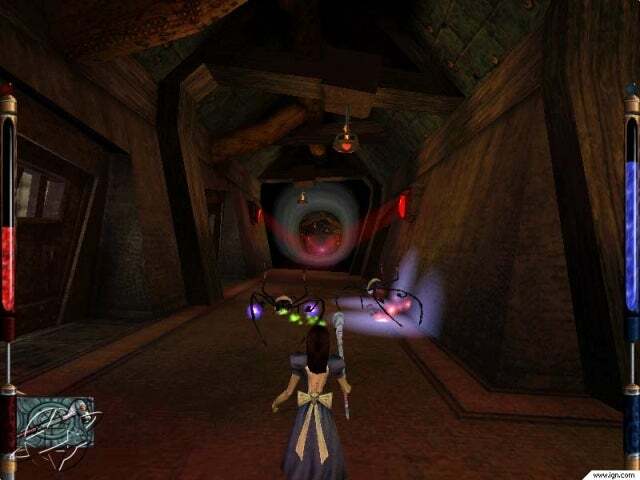 Both have strangely-proportioned rooms, platforms that lead to nowhere, and long guarded corridors with strange statues or random flying objects. Both feature diminutive nutcases who run around with goofy smiles on their faces and huge metal contraptions on their heads, presu mably from a lobotomy. Some are making funny noises, others are crying, and still others are punching themselves in the faces. In one area, you’ll face what I think are cousins to Half Life’s headcrabs with neurotoxins, or maybe Sid’s baby doll/spider thing from Toy Story. These not-quite-right creatures, in addition to the broken and bent scenery (literally), help lend these areas a twisted feel. Combat is one of the game’s weaker elements. Alice is always strafing, so maneuvering around enemies and platforming can be tricky. Most of the enemies in the game are somewhat lackluster in their variety, and the bosses can be a bit of a bore. The main enemy is the generic playing card in its many incarnations, but more creative enemies including the Boojum, a kind of flying banshee, chess pieces, and giant robots. Some enemies are downright easy to defeat, and for others, you’ll have to use a bit more strategy. For example, ranged weapons work best on the Boojum, and the best strategy I found for fighting robots was calculated retreat. The boss battles are somewhat challenging, but once you’ve found each boss’s weakness, it’s usually just a matter of waiting until your magic regenerates so you can continue to use your good weapons. Then it’s just rinse and repeat, usually with the use of only one or two weapons. Despite the lack of variety in enemies, there are quite a few fun toys and weapons to play with in this game. My go-to weapon is the crochet mallet, with its ranged attack and close quarters melee capabilities. For many enemies in tight spaces, the Jack in the Box flame thrower is quite effective. If you like fire, there’s the Jabberwock Eye staff that acts like a laser, and there’s the Ice Wand for you ice types. Fun! There are a few other problems with the game as well. Do not rely on the game’s auto-save function. I found myself saving at least every 30 seconds during difficult sections. Otherwise, I’d have to replay entire levels. It is a very linear game that does not encourage a lot of extra exploration, so don’t expect to be able to wander about in the madness. You’ll have to solve puzzles that are often almost too easy and perform platforming moves that aren’t so easy with Alice’s constant strafing. For example, to collect the parts of a growth potion, you need to visit various parts of the school, then maybe fight a Cardguard or two. this game; it’s still an entertaining game, especially on the first playthrough. Let’s see what the sequel has in store for us too in my next review!